This year saw the return of the Farnborough International Airshow with another amazing display of aircraft, including the well known Red Arrow display team. Little did the airborne acrobatic flyers realise that they were unknowingly helping to rescue ailing animals on the ground. A local hedgehog rescue – The Happy Hedgehog Rescue in Yateley has reported an increased number of hedgehogs brought to the rescue during the weeks of the show,taking in 14 hedgehogs in from Farnborough alone. “This wasn’t obvious at first.” said Jayne from the Happy Hedgehog Rescue. “There is a reasonable hedgehog population in Farnborough and we do get hedgehogs in from there throughout the year but when filling out the admission forms and address details it became obvious that there was a sudden influx from that area during the period of the show.” It would appear that the pleasant weather and the opportunity to watch the flying display bought more people into their back gardens and as a result more hedgehogs were found . Jayne contacted Airshow organisers Farnborough International Ltd (FIL) to let them know of her discovery. Speaking about the discovery, Shaun Ormrod, Chief Executive for FIL said “The gardens of our local residents have always provided a great vantage point to view the flying display. 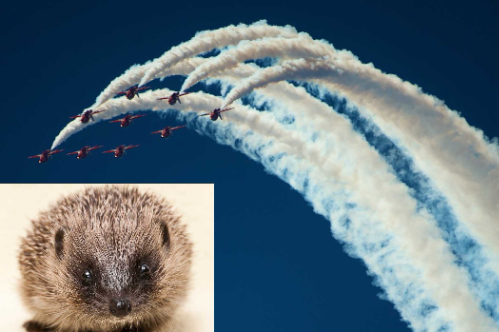 We are pleased that the airshow has had such a positive impact in this way and helped to save so many of our local hedgehogs. Jayne added “It is so good that the people have realised that A HEDGEHOG OUT IN THE DAY IS IN TROUBLE AND NEEDS HELP!” When hedgehogs are seen out in the day people often think it’s cute and don’t realise the hog is really poorly until it appears to be sunbathing on the lawn etc. Hedgehogs DON’T sunbathe! At this stage they are a lot harder to save as they have been ill for quite some time. Wild animals hide their illness to discourage predation. Hedgehogs struggle to gain access to many gardens these days as we fence ourselves in and this means they have access to less possible food. Hedgehogs are great for the garden and are a gardener’s friend by eating many of the bad bugs.